I’ve been gardening in Oregon for a few years now, and I’m coming to appreciate evermore the humble fava bean. The first time I encountered it was in a cover crop seed mix that I got at the local garden store. I started using “field favas” and crimson clover as standard fare to plant in the fall to have something growing over our rainy winter. 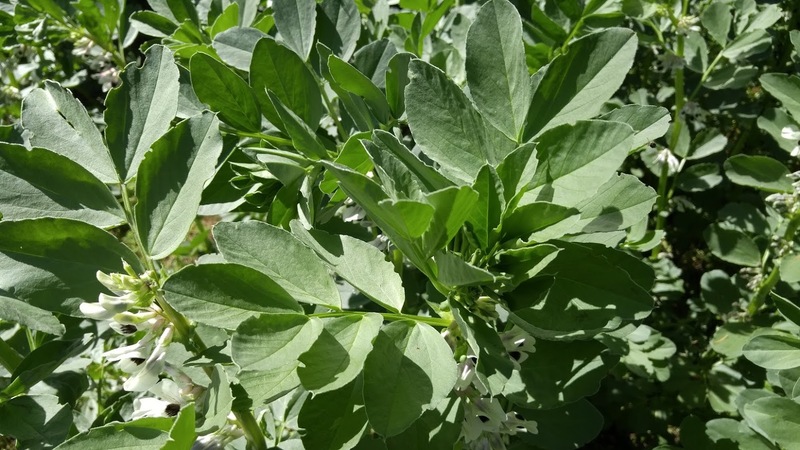 It became clear that the favas were really good at growing in the off-season, better than just about any other legume, so if I want a nitrogen builder in the cover crop, favas are a good choice. Usually I will till the plants back into the soil in the spring as soon as the ground can be worked in preparation for the new season. A nice fava been cover crop in December. Often I’ll save a patch for the bees and for next year’s seed. The field favas have a rather small bean, but it doesn’t take many plants to generate a quart or two of seed. 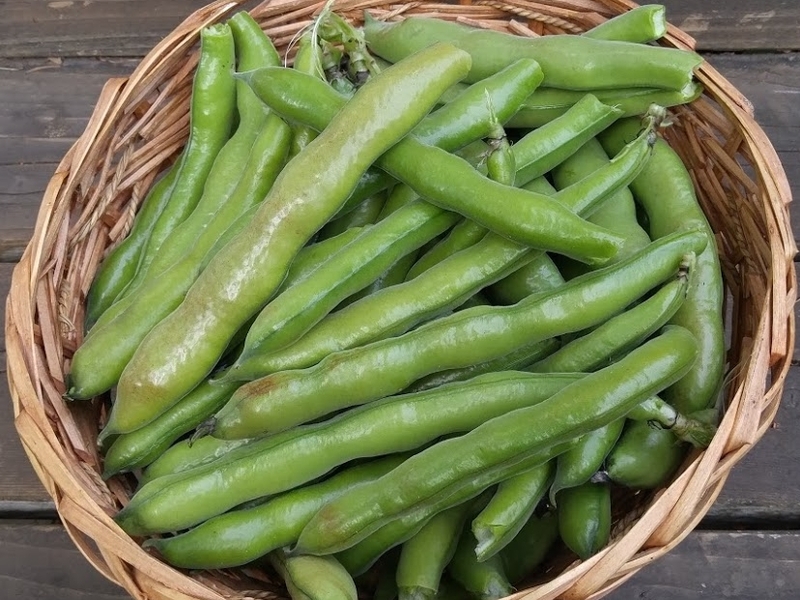 But favas aren’t just a cover crop; people eat them! The choice for human consumption are the ones that produce giant beans. There are a few named varieties out there, Windsor Broad and Aprovecho Select, are a couple. In our region, Adaptive Seeds has some great varieties including the Aprovecho Select with truly gigantic seeds. As my taste for favas has grown, I’ve gradually been planting more of the big beans. 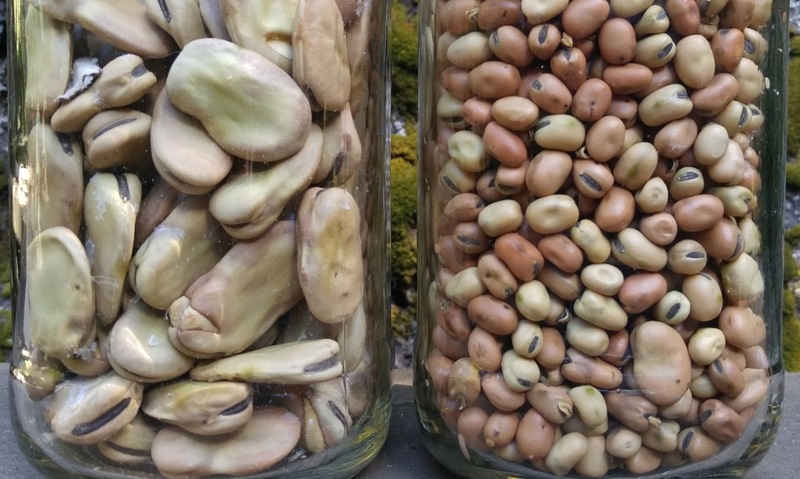 I’m almost always planting saved seed, so I’ve noticed that the big beans and the field favas will cross and produce beans of intermediate sizes; you have to continually select for the big ones if you want to keep them going. 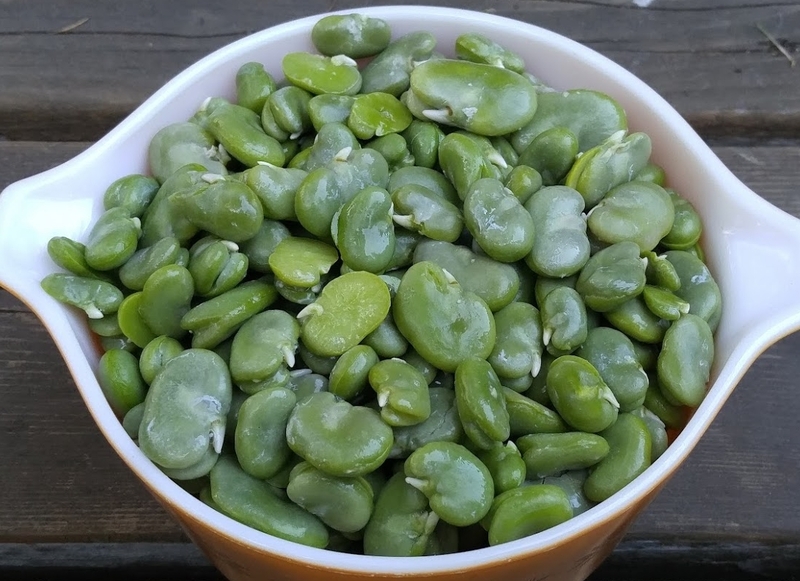 If you Google fava bean recipes you will find almost all of them tell you to peel the outer skin off of the bean and just use the tasty bean inside the bean. That is all well and good if you have the time and patience. However, I find that if you pick the pods when the beans are not over-mature, the you can just eat the whole bean and they taste just fine. In fact, I prefer the complete tooth-feel of the bean still in its outer skin to the uniformly creamy texture of just the bean hearts. As a general vegetable, I just cover the beans with water and boil them for 2 to 5 minutes. Discard the cooking water; it will pick up a bitter taste that is associated with the skins. You could even give them a quick rinse. Like many vegetables, they respond well to salt, pepper, garlic and butter or olive oil. Later in the season when you are clearing out the crop and the beans are a little long in the tooth, especially if you have a bunch of kids that need to be kept busy, you could cook up a mess of them and pop out the bean hearts for that special recipe that you found on the internet. The peeled beans are equally delicious and can be used as an ingredient in many other dishes where the creamy texture blends better with other foods. If you seriously eat out of your garden most of the time, you miss it when there is nothing to bring in. This is the fava bean’s best feature. The beans come on in May and early June before just about anything else is producing large quantities of food. The favas, growing all winter, are by now very robust plants that can really feed you. Favas also have another less appreciated culinary use. The tender top shoots from the fava plant are quite tasty greens, either fresh in salads or cooked like collards or chard. Once again, the timing of this production of fresh greens is in the off-season when there is not much else. In the top photo you can see my basket as I was gathering a fresh salad of fava tops in December. When the fresh growth comes in the spring, again there is an abundance of tasty greens available before your lettuce has sprouted. Once the beans get too starchy, and your appetite for them has waned, leave what is left on the plants for another week or two to fully mature and begin to dry down. Plants with mature beans can be pulled up and placed in the sun to further dry, the rest go on the compost pile so the bean patch can be used to another crop. When the pods are crunchy, shell the seed beans. Favas saved for seed, like peas, are subject to the pea weevil. Once I’ve harvested the beans I immediately place them in the freezer for a couple of weeks and that kills the weevils before they can chew little round holes in the beans. By this time, summer is here and you are looking for a place to plant winter brassicas and other late season crops. The recently vacated fava patch is ready for you. In the fall, the section of the garden that had squash or corn tend to be good size pieces of dirt free of straggling late season crops. On a nice day in late October, I’ll till up those sections and plant the favas for the next year. I broadcast the field favas and rake the seed into the bed. The big eating beans are best planted individually in rows. Occasionally we will have a cold freeze, below 15° F, that will kill many of the favas. A few dry leaves as a mulch can help reduce cold damage, but no matter the favas will look pretty tattered in freezing weather. Yet somehow they usually pull through, perk up, and start growing again just when you are aching for some greens. Lovely post on the fava bean, Gary. Did you know the Roman’s four most distinguished families were named after beans? Fabius (fava bean), Lentulus (lentil), Piso (pea), and Cicero (chickpea). Thanks Bo, That is an interesting tidbit of information. Just goes to show the importance of these crops historically! I know, I know, Gary, the ‘world’ may not need another gardener’s home gardening way to go, but we do need the warm and intelligent Gary Rondeau style: So how about the whole enchilada?